well, i say saturday, it was actually saturday and monday. the stars of the show were the individual venison and mushroom pies. i bought the venison at borough market as part of a vague new years’s resolution type thought about choosing things i’ve not cooked before and an awareness that game is something i rarely buy. it was quite pricey – c£6 for 500g – but wonderfully lean and full of flavour. 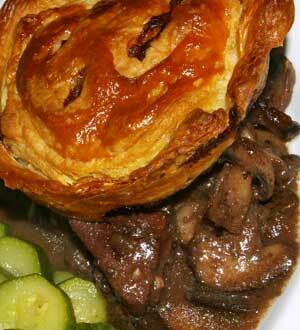 paired with mushrooms – a mix of chestnut mushrooms, porcini and shitake – and both marinated and braised in red wine, the venison had a flavour that reminded me of kidney (from the steak and kidney pies of my childhood which i adored). the flavours balanced wonderfully and, as i ate this, i kept thinking that this is the sort of dish that makes home-cooking so worthwhile. we ate this with roasted pumpkin wedges and garlicky courgettes. the courgettes deserve a word of praise too – slowly cooked in a lidded pan with garlicky butter they were meltingly soft and very delicious. put the venison into a stainless steel or ceramic bowl with the red wine, garlic, thyme and bay leaf. cover and marinade in the fridge several hours (you can leave it up to 48hours). drain the meat, reserving the marinade, and use kitchen paper to dry the meat before adding seasoning and the flour and mixing together. heat the vegetable oil in a large frying pan and fry the meat on a high heat, a few pieces at a time, until it is browned. remove the meat and set aside. add the butter to the pan** and gently fry the onions for a few minutes until they begin to soften. add the mushrooms, cover and fry gently until the mushrooms are softened. add the venison, reserved marinade and 200ml stock and leave to simmer, partly covered, until the meat is tender (i simmered mine for an hour). add extra stock if you need to. when the meat is the sauce should have thickened sufficiently. if not, dilute a little cornflour in some water and stir it into the sauce and simmer for a few minutes. 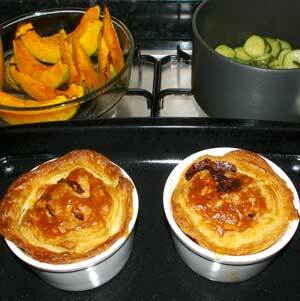 put the meat into your pie dish – i used 4 ramekins to make individual portions – and top with puff pastry lids. make hole holes in the pastry for the steam to escape, brush with egg and bake for 35 minutes when the pastry will be cooked and golden. ** if there is a lot of stuff stuck to the bottom of the pan as a result of frying the floured venison, add a little red wine/stock/water and stir well as it bubbles away, to remove all the stuck on bits. pour this into your jug of reserved marinade so you don’t lose any of the flavour.